Kid Time Enterprises, LLC: I am a youth honoree! I am a youth honoree! scholarships offered by this nonprofit to help single parents in Maryland. You may support a great cause by attending the upcoming gala, or by making a donation. 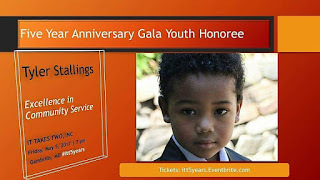 See http://www.ittakestwoinc.org/event/five-year-anniversary-gala. Ms. Jaemellah Kemp is the founder and CEO of It Takes Two, Inc. I truly appreciate Ms. Kemp's support. She also donated books to me for my traveling book festival. New #1000bookgiveaway stops are coming. I will come back to this place, its huge and open, and have really tall ceilings. Wait staff was also pretty good. Bartender was awesome and personable. I was really pleased with my party at Chicago event space here. Ha! I highly recommend these guys. I was honored by Mayor Pantelides in Annapolis!